Reading the Fantastic Four comics from the start. In issue #312, the team’s newest member continues to have a tough time with things. This is also part of a crossover that’s not much of crossover that we’re barely crossing over with anyway. 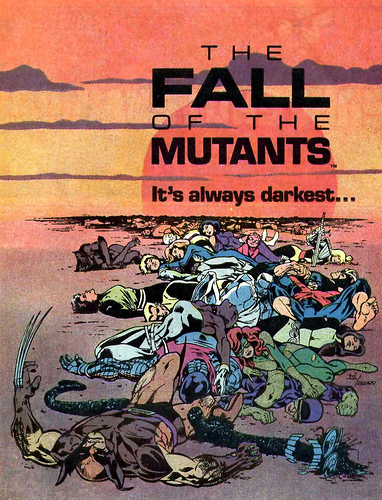 The Fall of the Mutants was an epic X-Men crossover, in which the X-characters didn’t actually cross over with one another. (If I were more cynical, I might almost think that Marvel slapped a crossover logo on covers of a bunch of otherwise unrelated comics to sell more copies. Marvel wouldn’t do that, would they?) In Uncanny X-Men, the X-Men died fighting demons (there are more demons in X-Men lore than you’d think). Except they didn’t really die, and instead got a top-secret new headquarters in Australia. 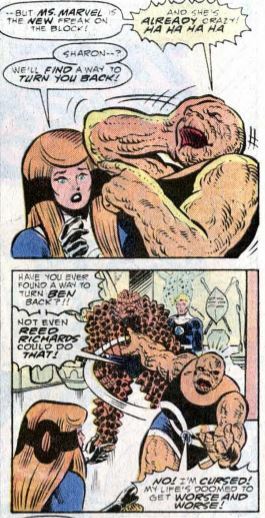 In New Mutants, there was a lot of sitcom-type humor as the teen heroes helped the alien-like Bird Brain explore life on Earth. The real action took place in X-Factor, where the reunited original five X-Men had their first-ever battle against Apocalypse (his first appearance) and then dropped the they’re-pretending-to-be-evil-mutant-hunters-to-secretly-rescue-mutants storyline. 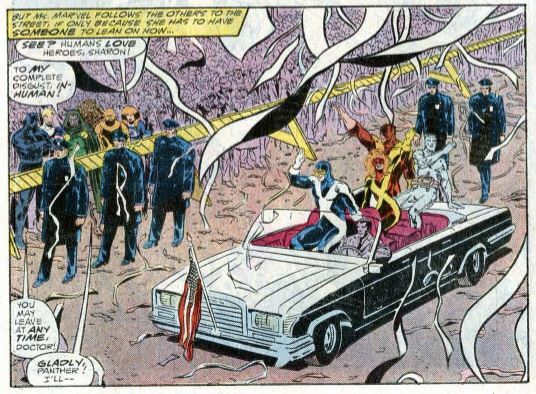 After saving New York from Apocalypse, the city gave X-Factor an old-timey ticker tape parade! Along the way, Incredible Hulk, Power Pack, Captain America, Daredevil, and, yes, Fantastic Four had tangential tie-in issues. All you really need to know for this FF issue is that X-Factor is getting a parade, and you’re good. We begin in Wakanda, where Johnny and Crystal are reunited with Ben and Sharon, learning for the first time that Sharon has been transformed into a Thing. Sharon’s still not taking it well, exclaiming that if Reed could never cure Ben, then there’ll never be a cure for her. Our heroes also catch up with Dr. Doom, who is staying in Wakanda in political asylum after he was overthrown as king of Latveria by Kristoff. The FF don’t like Doom hanging around, but Black Panther assures them that while monarchs share a certain bond, the Panther’s bond with the FF and the Avengers is even stronger. The Panther and the FF return to New York, and Dr. Doom tags along, claiming to have unrelated business in NYC. Then we check in with Kristoff. Remember that he’s the little kid who’s been brainwashed to think he’s Dr. Doom, and wears an adult-sized suit of armor to fool everyone into thinking he’s Doom. A servant reports that “the imposter” a.k.a. the real Dr. Doom, is on the way to New York. Our heroes, with Doom still in tow, arrive in New York and attend the X-Factor parade. They just barely are able to remark how the mutants have been accepted as heroes now, when the parade is attacked by soldiers on flying platforms. These are Latverian Stormtroopers, there to destroy Doom on Kristoff’s orders. 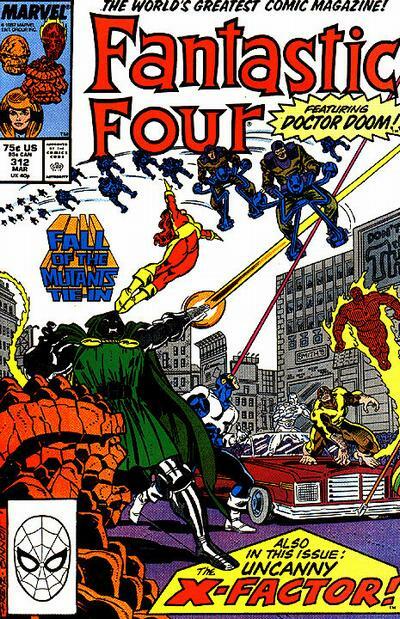 The FF, X-Factor, Black Panther, and Dr. Doom all work together to fight the Stormtroopers. During the battle, Sharon hides off to the side, freaking out about how she’s a monster now. The Beast hides out alongside her. His current subplot in X-Factor is how he loses more and more of his intelligence every time he uses his powers, so he too is afraid to fight. The Stormtroopers retreat, and Doom reveals why he came to New York: He wants to recruit X-Factor to help him reclaim the Latverian throne. X-Factor turns him down immediately (what on Earth made Doom think they’d want to join him? ), so Doom retaliates by trapping Sharon and Beast in an energy field shaped like a big fist (comics!). Doom escapes into the sewers, and the heroes pursue him. Doom makes his way to a hidden elevator deep underground, which takes him straight to Reed’s sealed up laboratory inside the FF’s headquarters. Doom says he knows the way there because he has hidden cameras everywhere in New York. The heroes pursue, with Black Panther tracking Doom’s path through the sewer, and the mutants clearing debris out of his way. In Reed’s lab, Doom traps Sharon and Beast inside a “static cage.” Sharon says she doesn’t know how to fight back against Doom. Beast tells her to snap out of it, saying that unlike him, she has both her strength and her mind. Sharon uses her newfound Thing strength to break out of the cage. 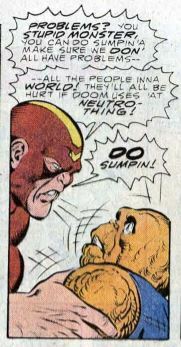 Doom fights her using a “nega-neutrino displacement diaphragm,” which looks like a big gun. Beast joins the fight, acting animalistic as he uses his powers. The rest of the heroes arrive, and Ben subdues the out-of-control Beast. Still in the fight, Doom grabs Crystal by the neck, saying it’s her life in exchange for his freedom. Black Panther says Doom may leave the building under his protection, but after this they’re enemies again. Doom departs, and Ben and Sharon have a heart-to-heart. She says that even though her body is horribly mutated, she still has her mind, and her honor. Sharon promises “No more moaning!” (We’ll see about that.) Then she says it’s time to get on with being the Fantastic Four. Clobberin’ time: In his thoughts, Ben admits feeling the same way about himself that Sharon feels about herself, but that he can’t say it out loud because he’s expected to be the team leader now. Flame on: Although he’s present throughout the issue, Johnny does very little in this one. He admits he’s learned that not all mutants are bad people. Fantastic fifth wheel: This debuts Sharon’s new FF uniform, the dark-blue-and-white style, featuring both a “4” and an “M” logo. Crystal says she didn’t join X-Factor in the fight against Apocalypse, because she felt the mutants had it under control. This kind of makes her look like a jerk, but it’s consistent with her family the Inhumans, as their only desire has been to be left alone. Here we have Dr. Doom fighting alongside the FF, but his status as an alternate member of the team isn’t mentioned, so I don’t think we can count this one. Trivia time: The Beast started losing his intelligence after a fight with Pestilence, one of Apocalypse’s “four horsemen.” He got smart again much later, after mutating back into his blue-and-furry form. Fantastic or frightful? What a mess. In the last issue, Sharon cried all issue then said she’s okay. Then in this issue, she cries all issue and says she’s okay at the end. It should be great to have a female superhero with a non-supermodel body type, but Sharon keeps crying about her body, which makes these comics all depressing and uncomfortable. 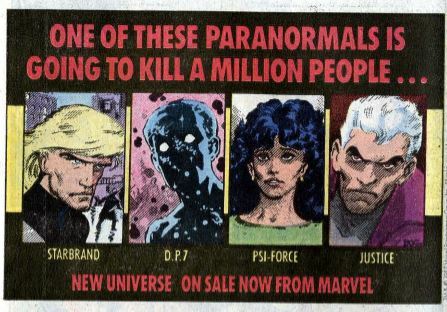 It’s yet another example of “good idea, poor execution” that mars this era of the comic. Also, you’d be right in thinking the X-Factor appearance is little more than an extended cameo. None of this was even mentioned in their own series. Next week: Way down in the underground.